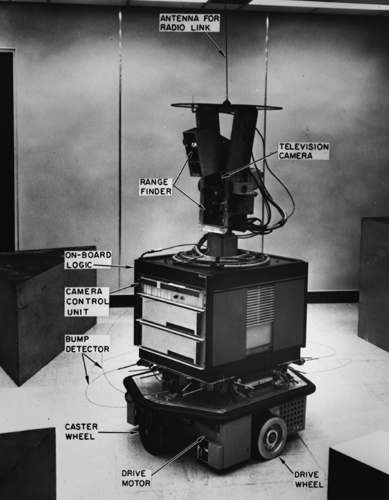 From 1966 through 1972, the Artificial Intelligence Center at SRI International (then Stanford Research Institute) conducted research on a mobile robot system nicknamed “Shakey.” Endowed with a limited ability to perceive and model its environment, Shakey could perform tasks that required planning, route-finding, and the rearranging of simple objects. Although the Shakey project led to numerous advances in AI techniques, many of which were reported in the literature, much specific information appears only in a series of previously relatively inaccessible SRI technical reports. In 1969, the demonstrations of Shakey were collected in a 24-minute film “SHAKEY: Experimentation in Robot Learning and Planning” (91.7MB RealVideo). The possibilities of Computer Science and Artificial Intelligence caught the public's imagination. After an April 10, 1968, article in the New York Times about Shakey and two other robot efforts (MIT & Stanford), Life Magazine refered to Shakey as the “first electronic person” in 1970. In November 1970, the National Geographic Magazine also carried a picture of Shakey in an article on the present uses and future possibilities of computers. Originally, Shakey was controlled by a SDS-940 computer acquired in 1966 with 64K 24-bit words of memory. Programmed in Fortran and Lisp, Shakey's problem solving was done in QA3. This was replaced by a “large” PDP-10 around 1969 with 192K 36-bit words of memory. STRIPS was then used for problem solving, with QA4 developed later. When the movie was made, Shakey's programs occupied over “300,000 36-bit words” (~1.35MB). Shakey is now on display at the Computer History Museum in Mountain View, California. These publications cover six projects that involved Shakey and associated AI efforts. Application of Intelligent Automata to Reconnaissance [March 17, 1966, to December 5, 1968]. Research on Intelligent Automata [August 7, 1968, to November 7, 1969]. A good overview of Shakey can be found in the AIC Technical Note 323. These reports are ordered from earliest to most recent. Rosen, C. A. and Nilsson, N. J. Application Of Intelligent Automata to Reconnaissance, Technical Report . Stanford Research Institute, November 1966. Rosen, C. A. and Nilsson, N. J. Application of Intelligent Automata to Reconnaissance, Technical Report . Stanford Research Institute, March 1967. Rosen, C. A. and Nilsson, N. J. Application of Intelligent Automata to Reconnaissance, Technical Report . Stanford Research Institute, December 1967. Nilsson, N. J., Raphael, B. and Wahlstrom, S. Application of Intelligent Automata to Reconnaissance, Technical Report . Stanford Research Institute, May 1968. Nilsson, N. J., Rosen, C. A., Raphael, B., Forsen, G., Chaitin, L. and Wahlstrom, S. Application of Intelligent Automata to Reconnaissance, Technical Report . Stanford Research Institute, December 1968. Nilsson, N. J. Research on Intelligent Automata, Technical Report . Stanford Research Institute, February 1969. Green, C. Application of Theorem Proving to Problem Solving, Technical Note 4. AI Center, SRI International, 333 Ravenswood Ave, Menlo Park, CA 94025, Mar 1969. Nilsson, N.J. A Mobile Automaton: An Application of Artificial Intelligence Techniques, Technical Note 40. AI Center, SRI International, 333 Ravenswood Ave, Menlo Park, CA 94025, Mar 1969. Coles, L.S. and Green, C. Chemistry Question-Answering, Technical Note 9. AI Center, SRI International, 333 Ravenswood Ave, Menlo Park, CA 94025, Jun 1969. Green, C. The Application of Theorem Proving to Question-Answering Systems, Technical Note 8. AI Center, SRI International", 333 Ravenswood Ave, Menlo Park, CA 94025, Jun 1969. Coles, L. S., Duda, R. O., Garvey, T. D., Munson, J. H., Raphael, B., Rosen, C. A. and Yates, R. A. Application of Intelligent Automata to Reconnaissance, Technical Report . Stanford Research Institute, November 1969. Duda, R.O. and Hart, P.E. Experiments in Scene Analysis, Technical Note 20. AI Center, SRI International, 333 Ravenswood Ave, Menlo Park, CA 94025, Jan 1970. Chaitin, L. J., Duda, R. O., Johanson, P. A., Raphael, B., Rosen, C. A. and Yates, R. A. Research and Applications - Artificial Intelligence, Technical Report . Stanford Research Institute, April 1970. Project 8259 Interim Scientific Report. Rosen, C.A. An Experimental Mobile Automaton, Technical Note 39. AI Center, SRI International, 333 Ravenswood Ave, Menlo Park, CA 94025, Jul 1970. Duda, R.O. Some Current Techniques for Scene Analysis, Technical Note 46. AI Center, SRI International, 333 Ravenswood Ave, Menlo Park, CA 94025, Oct 1970. Duda, R.O. and Hart, P.E. Use of the Hough Transformation to Detect Lines and Curves in Pictures, Technical Note 36. AI Center, SRI International, 333 Ravenswood Ave, Menlo Park, CA 94025, Apr 1971. Fikes, R. E. Monitored Execution of Robot Plans Produced by STRIPS, Technical Note 55. AI Center, SRI International, 333 Ravenswood Ave, Menlo Park, CA 94025, Apr 1971. Raphael, B., Chaitin, L. J., Duda, R. O., Fikes, R. E., Hart, P. E. and Nilsson, N. J. Research and Applications - Artificial Intelligence, Technical Report . Stanford Research Institute, April 1971. Fikes, Richard E. and Nilsson, Nils J. STRIPS: A New Approach to the Application of Theorem Proving to Problem Solving, Technical Note 43R. AI Center, SRI International, 333 Ravenswood Ave, Menlo Park, CA 94025, May 1971. Raphael, B., Duda, R. O., Fikes, R. E., Hart, P. E., Nilsson, N. J., Thorndyke, P. W. and Wilber, B. M. Research and Applications - Artificial Intelligence, Technical Report . Stanford Research Institute, December 1971. Fikes, R.E., Hart, P.E., Nilsson, N.J. Learning and Executing Generalized Robot Plans, Technical Note 70. AI Center, SRI International, 333 Ravenswood Ave, Menlo Park, CA 94025, Jul 1972. Hart, P. E., Fikes, R. E., Garvey, T. D., Nilsson, N. J., Nitzan, D, Tenenbaum, J. M. and Wilber, B. M. Artificial Intelligence - Research and Applications, Technical Report . Stanford Research Institute, December 1972. Nilsson, N. J. Artificial Intelligence - Research and Applications Volume 2, Technical Note . AI Center, Stanford Research Institute, May 1975. After an extended period of exploring other areas of Artificial Intelligence, the AI Center again turned to robots as a focus of significant AI challenges. Beginning in 1984, Flakey became the AIC's second-generation mobile robot. In 1994, Flakey, was featured on the PBS show Scientific Amercian Frontiers, hosted by Alan Alda. Flakey had real-time stereo vision algorithms to distinguish and follow people, and the DECIPHER speech recognition system to respond to spoken commands. Flakey won prizes at the 1992 and 1993 AAAI Robot competitions. The Centibots are a team of 100 autonomous robots (97 ActivMedia Amigobot and 6 ActivMedia Pioneer 2 AT). The goal of the project was to demonstrate 100 robots mapping, tracking, guarding in a coherent fashion during a period of 24 hours. The experiments were carried out successfully in January 2004.